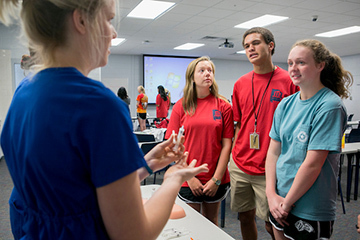 Samford University will welcome 90 of Alabama’s best and brightest high school seniors as they attend the 30th annual Alabama Governor’s School (AGS) program June 18–30. The students have outstanding academic records, according to AGS director George Keller, Samford associate professor of biology. The students come from 24 counties and 56 high schools in Alabama. Of the 71 students ranked in their classes, 16 are ranked first, eight are ranked second, and four are ranked third. Keller said that 69 of the 71 ranked students are in the top 10 percent of their class. The average grade point average for the students is 4.27, and the average ACT score is 29.28. During the two-week program, students attend classes on a wide range of topics, including health care, American legal system, arts, video production, magazine production, research science, business, the Martian frontier, photography, classics, web design, field biology, sports medicine, leadership, global citizenship and film studies. Classes are taught by Samford faculty and other professionals from the community. While at AGS, students also learn about scholarships and college study skills, attend a Birmingham Barons baseball game, work on a service project June 22 with the Woodlawn Foundation, attend a piano concert arranged specifically for them and hear about philanthropy while attending a dinner in their honor June 27 at the Birmingham headquarters of Protective Life. AGS participants are nominated by their schools based on academic ability, leadership qualities, creativity and community service. Selection also is based on written essays, and teacher and guidance counselor recommendations. In January 1988, then-Gov. Guy Hunt designated the Alabama Honors Academy as the Alabama Governor’s School at Samford University. It was patterned after governor’s schools in North Carolina, Virginia, West Virginia, Georgia, Mississippi and Kentucky. Carolyn Satterfield was the founding director of AGS, the role that Keller now fills. Satterfield continues to remain active with the project. AGS is a member of the National Conference of Governor’s Schools, and is funded by student tuition and fees, the William R. and Fay Ireland Governor’s School Endowment, private funding and Samford University.